In the spring of 2016, Dr. Jay Hartzell was appointed Dean of the McCombs School of Business. He earned a BS degree in business administration and economics from Trinity University and completed his Ph.D. at the University of Texas. Hartzell was on the faculty of New York University Stern School of Business when he was recruited to return to Austin in 2001. At the University, Dr. Hartzell holds the Centennial Chair in Business Education Leadership and the Trammell Crow Regents Professorship in Business. He has served as the chair of the finance department, Senior Associate Dean for Academic Affairs, and as the Executive Director of the McCombs School’s Real Estate Finance and Investment Center. His research has focused on real estate finance and corporate governance. Hartzell has also served on the editorial board for Real Estate Economics and has been an associate editor of the Review of Financial Studies. Dr. Laura Starks was appointed interim dean in 2015, and though she only served one academic year, she was the first woman to take the helm of the McCombs School. 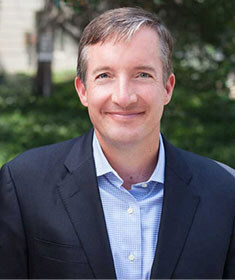 Starks has been highly involved on the Forty Acres, having taught undergraduate and graduate courses on environmental, social, and governance investing, along with global financial strategies and other finance topics. She directed the AIM Investment Center, has presided as chair of the Department of Finance, and served on the Board of Directors for the University Co-op. Off campus, Dr. Starks has been on the Board of Directors of four national academic finance organizations, served on the Investment Advisory Committee for the Employee Retirement System of Texas, as well as the Advisory Board of Texas Wall Street Women. She has been an independent director for TIAA-CREF Mutual Funds and been appointed to the Councils and Panels for the Norwegian Government Pension Fund, the largest sovereign wealth fund in the world. At the start of the 2008 fall semester, Thomas Gilligan arrived in Austin to head up the McCombs School, and there was little time to get acquainted or settle into the job. It was a turbulent election year, Wall Street was going through difficult times, and the University had just launched ambitious $3 billion capital campaign. No matter. By all accounts, the new dean brought with him a great deal of energy, focus, and new ideas, and left a positive, lasting legacy. A native of Oklahoma, Gilligan served in the U. S Air Force before earning a BA degree from the University of Oklahoma and a Ph.D. at Washington University in Saint Louis, both in economics. He began his academic career at California Institute of Technology in Pasadena, and was a visiting professor at Stanford and Northwestern, but his longest tenure had been twenty years on the faculty of the Marshall School of Business at the University of Southern California. Once in Austin, Gilligan oversaw the development of a new strategic plan for the McCombs School which reexamined and updated its mission and goals and introduced a flurry of new initiatives. A new Department of Business Government and Society was created, the popular business foundations courses were augmented with an online program, and the McCombs Teaching Awards were established to encourage and recognize excellence in business education. During Dean Gilligan’s tenure, the school saw a rise in faculty reputation, an expansion of undergraduate scholarships, and an increase in the number of companies that recruited McCombs students for internships and careers. Gilligan also successfully oversaw the planning and fundraising for a new, state-of-the-art facility for the MBA program – Robert B. Rowling Hall – that is scheduled to open in 2017. Raised in Saint Louis, Missouri, and Edwardsville, Illinois, George Gau was the first in his family to go to college. He enrolled at the University of Illinois, majored in finance, completed his bachelor’s degree, and went on to graduate school. But as a master’s student, he realized he still had no teaching experience and inquired about instructing a class, without pay if necessary. The chair of the finance granted Gau’s request – though with compensation – and after a semester in the classroom, Gau was hooked, and went on to earn his Ph.D.
Gau’s academic career began at the University of Oklahoma, where he conducted research in real estate and financial markets before he was recruited to join the faculty at the University of British Columbia. For the next decade, Gau was praised for his teaching and research. His conclusions on mortgage rate insurance were adopted by the Canadian federal government. He chaired UBC’s Urban Economics Division, and in 1986 was elected president of American Real Estate and Urban Economics Association. Two years later, Gau received a phone call inviting him to come to the University of Texas. 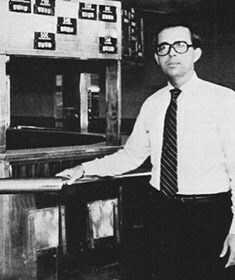 By 1992, Gau was chair of UT’s finance department and was making waves with his innovative ideas. Among them was the MBA Investment Fund, the first private investment company run by students, followed by the EDS Training and Technology Center. Opened in 1996 it was a state-of-the-art multimedia classroom with a satellite uplink, a trading room with live data to simulate Wall Street, and a conference room. Having earned his B.A. and Ph.D. degrees from Michigan State University, Bob May joined the UT accounting faculty in 1979 and quickly distinguished himself, both as an educator and administrator. Twice he served as chair of the Department of Accounting, balancing his research interests in auditing, financial reporting, and capital markets with his commitment to the classroom and the department. In 1995, when Dean Robert Witt left the Forty Acres to be president of UT Arlington, May was the top choice to serve as interim dean, and then was officially appointed Dean of the College of Business Administration the following year. University of Texas President Larry Faulker described May’s term as a dean as an “unparalleled commitment to the quality of the student experience and to building a strong foundation for continued excellence.” May oversaw significant renovations to the business building designed to improve the BBA student experience, including the Millennium Lab, Reliant Productivity Center, and the Frito-Lay Student Leadership Center, along with funding and development of the Ford Career Center. He revised the advisory council, first organized in 1960 under Dean White, as an active and supportive partner in business school affairs. The Texas Evening MBA program, the Kelleher Center for Entrepreneurship, and the ambitious 1998 laptop initiative for MBA students all debuted under May’s leadership. Of course, Dean May’s legacy will always be linked to the renaming of the school after the exceptionally generous $50 million gift by San Antonio entrepreneur Red McCombs in 2000. It could be said that Dean Robert Witt rescued the business school. Witt joined the UT marketing faculty in 1968, after having earned his B.A. in economics at Bates College in Lewiston, Maine, an MBA at Dartmouth, and his Ph.D. at Penn State. Students were quick to discover his talents as an educator, as garnered teaching excellence awards from University’s Cactus yearbook, the Ph.D. Student Association, and the College of Business Administration’s Student Council. Witt rose quickly through the academic ranks. 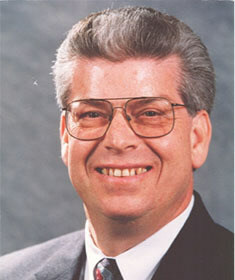 He chaired the marketing department for a decade, from 1973 – 1983, then was named Associate Dean for Academic Affairs by Dean Cunningham in 1983. 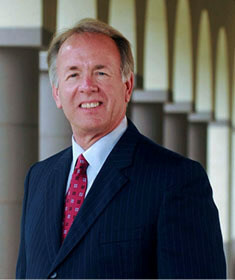 Two years later, when Cunningham became UT president, Witt was selected to take the helm. He served as dean for the next nine years. Witt’s tenure began just as a major renovation to the old Business-Economics Building (BEB), and the Graduate School of Business building was nearing completion. The complex was renamed the George Kozmetsky Center for Business Education and featured upgraded classrooms and offices throughout, along with a new atrium, created by closing in the old, four-story light well in the middle of the BEB. A courtyard on the east side of the building was replaced by a spacious new entry – dubbed the Hall of Honor – which featured “Old Number 9,” an early trading booth from the New York Stock Exchange, as a centerpiece. Suspended from the ceiling of the new entry was Classroom 2000, a first-of-its-kind version of the classroom of the future, which was used to launch the Information Systems management program. The additional room was welcome, as the business school was bursting at the seams. With more than 9,000 students, UT College of Business Administration was the largest in the country. Freshman and sophomore students were considered “pre-business majors,” and needed to complete a series of introductory business courses with a minimum GPA to be permitted into the upper-division BBA program. Classroom space and available faculty – for both undergraduate and graduate programs – were strained. There was often no space for non-business majors who wanted to enroll in a business course as an elective. In 1990, Dean Witt made the difficult decision to limit undergraduate enrollment to the school. The BBA sequence was retooled to once again be a four-year program, but admission was limited to about 1,000 new students each year. Within four years, the undergraduate enrollment had dropped to about 4,500 students, but this allowed for a better faculty-to-student ratio, stronger student and career placement services, less crowded classrooms, and a higher quality academic program overall. Witt’s efforts affected the Graduate School of Business as well, as it was ranked in the top twenty nationally by Business Week magazine in 1994. To accommodate non-business majors, Witt inaugurated the Business Foundations Certificate program, a series of classes intended to provide interested students a strong, basic understanding of business studies. The program has since become so popular that it was recently expanded with an online version under the direction of Dean Thomas Gilligan. Bill Cunningham began his UT academic career in 1971 as an assistant professor of marketing, having earned his B.A., MBA, and Ph.D. degrees from Michigan State University. He was also a newlywed. He and his new wife, Isabella, were introduced by a fellow Michigan State graduate student – and future UT business school dean – Bob May. 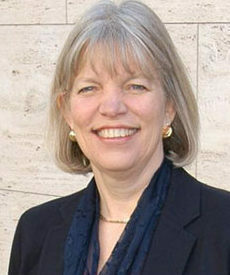 Cunningham quickly advanced through the academic ranks, to associate professor in 1973, and then full professor of marketing in 1979. Along the way, Dean George Kozmetsky asked Cunningham to be Associate Dean of Graduate Programs, much of which involved administering the MBA program. As Cunningham later recalled, the most exciting aspect of the job involved working closely with Kozmetsky. The two would often meet in Kozmetsky’s office from 5 – 7 a.m., when there were no other distractions, and in the process, Cunningham had found a valuable mentor. Over time, he was assigned additional administrative duties in the business school. When Kozmetsky announced his retirement in 1982, Cunningham was the natural choice to be the successor. Cunningham’s two-year term was a brief one, but he emphasized high academic standards, enrollment management for what was then the largest business school in the nation, and ensuring the school was financially secure. In 1983, the University celebrated its centennial year, and President Peter Flawn launched the Centennial Endowed Teachers and Scholars Program to endow professorships across the campus. In the course of his term, Cunningham was able to raise more than $24 million in gifts and matches to endow faculty positions in the business school. 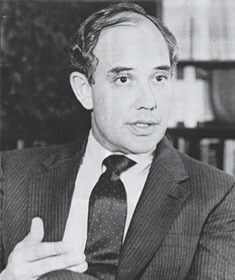 In 1985, the UT Board of Regents appointed Cunningham as President of the University. He served in that capacity until 1992, when he became the Chancellor of the University of Texas System. George Kozmetsky’s accomplishments were many, though to the McCombs School he is best appreciated as the dean who transformed a regionally strong college business program into a national leader. Kozmetsky was born in 1917 to parents who had emigrated to the U.S. from Belarus, just in time to escape the Russian Revolution and subsequent invasion by the Soviet Union. His father died when Kozmetsky was five years old, which left the task of raising him to his mother, Nadya, the person Kozmetsky credited for instilling in him a work ethic and passion for education. Kozmetsky did well in school, completed his bachelor’s degree at the University of Washington by the time he was twenty, and then opened the first CPA practice in Olympia, Washington. During the Second World War, Kozmetsky enlisted in the Army, was assigned to the medical corps, and spent time on the front line in Europe as the Army advanced through France, Belgium, and into Germany. He was awarded a Bronze Star with Oak Leaf Cluster, a Silver Star, and a Purple Heart. 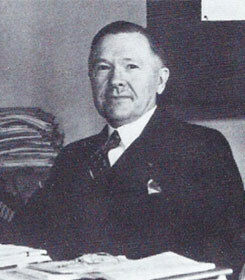 After the war, Kozmetsky continued his education, earned an MBA in 1947 and finished a Ph.D. in Commercial Science a decade later, both from Harvard. In 1960, he co-founded Teledyne, an entrepreneurial start-up that grew into a Fortune 500 company within six years. Kotzmetsky was getting noticed, particularly by the University of Texas, which recruited him to be the dean of its College and Graduate School of Business in 1966. Over the next sixteen years, Kozmetsky put in long days. He was regularly in his office by 4:30 a.m., meeting with local and national business leaders who were treated to breakfasts of corn flakes and orange juice. He recruited star-quality faculty, encouraged a cross-disciplinary approach to faculty research, emphasized technology in the business curriculum, and oversaw the completion of the Graduate School of Business Building in 1976. He made personal financial contributions to the school and tirelessly solicited important endowments that helped to boost the business program into the national rankings. Toward the end of his tenure, Kozmetsky founded the IC2 Institute, a think tank devoted to researching the intersection of business, government, and education. 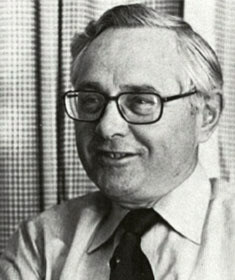 By 1983, just as Kozmetsky had finished his term as dean, he and the IC2 Institute were instrumental in bringing the Microcomputer and Technology Corporation (MCC) to Austin, chosen among sixty competing cities. Similar efforts wooed 3M in 1984, the Sematech in 1988, followed closely by AMD, Motorola, Samsung, and many others, which transformed the Austin cityscape into a high technology center, and fulfilled Kozmetsky’s vision of he termed a “technopolis.” He was one of the first two directors of the Dell Computer Corporation and was director emeritus of Dell until 2003. John Arch White’s academic career is a story of tenacity and dedication. Born in Mississippi, White grew up in the small town of De Leon, Texas, west of Fort Worth, before entering the University of Texas in 1919. He could afford to stay only a year, worked for the railroad to save money, then returned to Austin for his sophomore year in 1921. For the next six years, White taught at the Sanderson, Texas High School, where he also served as principal and basketball coach. White re-entered the University in 1928, completed his BBA degree in 1929, his MBA degree a year later, then earned his Ph.D. in business in 1937. For the next three decades, White continued to serve the University and advanced through the academic ranks until he was named the first chair of the Department of Accounting when the College of Business Administration was reorganized in 1945. He was named associate dean in 1954 and finally succeeded William Spiegel as dean in 1958. In 1958, the University celebrated its 75th anniversary, and a Diamond Jubilee Commission was created UT President Logan Wilson to “chart the University’s next 25 years.” The group created a series of recommendations intended to bring UT up to the top tier of the nation’s universities, and White oversaw a complete revision of the business curriculum as part of that effort. Emphasis was placed on professional and leadership development, mathematics, and technology. He also initiated the Business Honors Program and created the Advisory Council for the college. White was also heavily involved in the planning of the Business-Economics Building, which opened in 1962. Taking full advantage of the new facility, White approved a $75,000 purchase of an IBM 1620 data processing system, a room-size computer that could execute over 1,000 computations a second, cutting edge for its time. Every BBA student was required to use it as part of an introduction to computer programming. In 1968, poor health required White to retire from the University faculty after 38 years of service. In honor of his dedication to UT and the business school, a special retirement dinner was organized, and the first business professorship, named for John White, was announced. Like his predecessor, Dean Fitzgerald, William Spriegel hailed from West Virginia, where he grew up in the state capital of Charleston. His academic interests varied widely. He attended Lebanon Valley College in Annville, Pensylvania, and earned a B.A. degree in economics, Greek, Latin, and philosophy in 1914, then completed a B.S. degree in chemistry, physics, and mathematics the following year. He went on to finish an MA degree in psychology and a Ph.D. in economics and business, both from the University of Michigan. Before coming to Austin, Spriegel had an eventful military, business, and academic career. He served as an aviator and test pilot during the First Wold War, then was employed by the United States Rubber Company, the Doge Brothers Company, and Fisher Body Corporation, all in the Detroit, Michigan area. The economic collapse of the Great Depression forced Spriegel to change careers, and he entered higher education, first as a professor of economics at Western Kentucky University, then as a professor of industrial management at Northwestern. 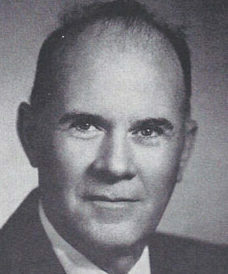 In 1948, Spriegel was recruited by the University of Texas to head the management department, then became Dean of the College of Business Administration in 1950. Spriegel distinguished himself as an energetic and devoted administrator. He guided the college through years of growth, raised standards and improved services, continued to teach courses in management, and tirelessly advocated for a new business facility to replace the hopelessly crowded Waggener Hall. Near the end of his term, his efforts were rewarded with the approved funding of a new Business-Economics Building. A native of West Virginia, Anderson Fitzgerald received his bachelor’s degree from Georgetown College in Kentucky before earning his masters in 1907 and Ph.D. in 1925, both from the University of Chicago. Before joining the faculty at the University of Texas, Fitzgerald acquired teaching experience at Marshall College, the University of Toledo, and Ohio State University. 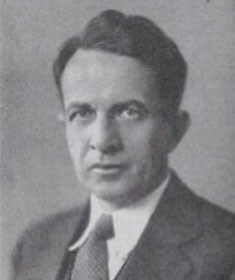 Named dean of the business school in 1926, Fitzgerald oversaw the founding the Bureau of Business Research the same year, then guided the school into its first permanent building in Waggener Hall in 1931. He founded a business placement office in 1940 and chaired the University’s war bond drives during World War II. In 1945, when the school was reorganized into the College of Business Administration, Fitzgerald created its first five academic departments: accounting, marketing, management, finance, and general business. 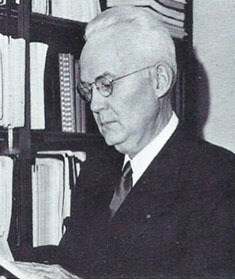 A valued member of the business faculty since 1918, Karl McGinnis served as interim dean for the 1925-26 academic year. Originally from Pennsylvania, McGinnis received his BA degree from Missouri Valley College in 1907 and completed a law degree at the University of Chicago in 1923. 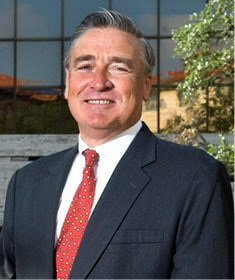 During his extensive career at UT, he taught business law, marketing, and the principles of real estate. A popular and effective teacher, McGinnis was often requested to be a guest speaker at public events, both to students and alumni. McGinnis retired from the faculty in 1958 and was awarded the title Professor Emeritus. Hired on April 1, 1912 as the University’s first professor of business training, Spurgeon Bell was appointed Dean of the new created School of Business Administration in 1922. 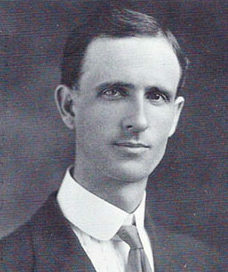 A 1903 UT graduate in economics, Bell was on the faculty of the University of Missouri when President Sidney Mezes recruited him to return to Austin and begin a business training program. He completed his MBA degree at Harvard in 1915. During the First World War, Bell was given a leave of absence to enlist in the U.S. Army, rose to the rank of Major, and was stationed in Washington, D.C. with the statistics office. Bell guided the infant business school through its first years, and taught classes in accounting and statistics, along with survey courses in banking and corporations. Additional instructors were brought aboard to fill out a curriculum in marketing, management, insurance, and finance. Because the University was growing faster than its funding allowed, monies for proper new classroom facilities weren’t available. Instead, cheap, temporary pinewood shacks were constructed and given letter names. Heated by potbelly stoves in the cooler months, Bell often had to arrive early, stoke the coals left by the custodian the night before, and retrieve wood from a pile behind the building to heat the classrooms.